Hello, A Game of Thrones fans! 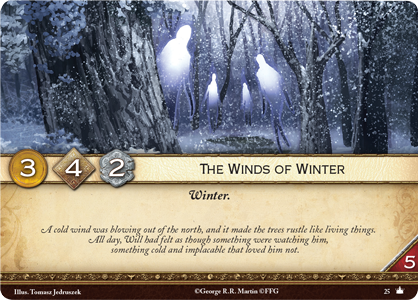 To help tide you over until the eagerly anticipated release of the second edition Core Set, I wanted to take a moment to share a little conceptual artifact from the first edition with a new generation of fans: the A Game of Thrones: The Card Game player archetypes, as originally defined by designer Eric M. Lang in the first year of the A Game of Thrones collectible card game. Of course, I realize that we have a large number of returning players who are already familiar with these concepts. Instead of simply rehashing the existing material for a new audience, I will attempt to expand the initial conversation by asking myself what we’ve learned about these archetypes in the past thirteen years and how they might have changed or evolved since Eric’s original presentation. So, without further ado, I bring you Ned, Shagga, and Jaime… revisited. What is a player archetype? Put simply, a player archetype is an imaginary player with a powerfully defined, idealized sense of why he or she plays the game and what he or she wants out of it. As a design tool, player archetypes are useful for understanding the hopes and motivations of our audience. We understand that most players are a blended combination of the various archetypes, but thinking about archetypes in an extreme, idealized form still helps to ensure that we look at the game from different perspectives and serve the entire spectrum of our audience. How has my understanding of the Ned archetype grown over the years? I think the important thing is that I’ve learned to notice the various layers of Nedliness. My first impression was that a card was either Nedly or un-Nedly, but I soon discovered it wasn’t so simple. 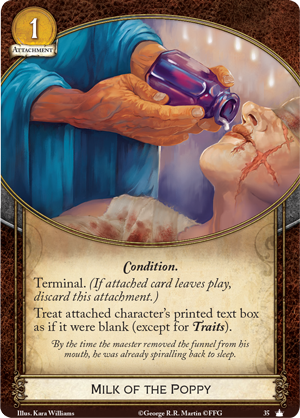 Most obviously, there is surface level Nedliness, where the traits, artwork, card titles, and flavor text directly reference the source material. 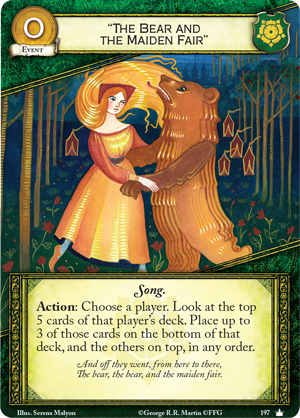 There is a micro level, card by card aspect of Nedliness, where a card’s ability strongly implies a specific occurrence in the books— The Things I Do For Love (Core Set, 101), for instance, refers directly to one of the defining moments in the first book. 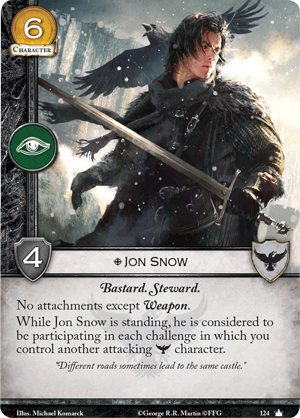 There are also higher, macro levels of Nedliness—it’s Nedly for the Night’s Watch to be a generally defensive faction, for example. Finally, there’s the immersion and the play patterns—are the negotiations of a melee game Nedly? Do I feel as if I am setting up an elaborate scheme as I build and manage my plot deck? Because I’m more aware of these layers of Nedliness, I pay more attention to places where the layers come into conflict with one another. 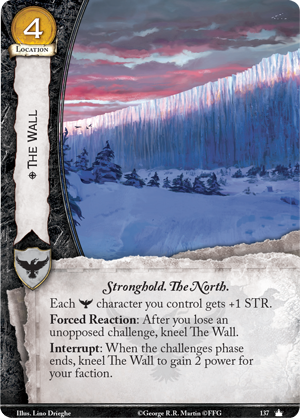 For instance, there are strong Nedly reasons for prominent members of the Night’s Watch faction to be aggressive at the card-based micro level, although the faction as a whole is generally more defensive. 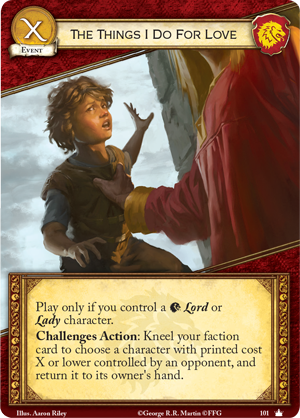 This creates a conflict that must be navigated carefully, and trying to let these conflicts coexist in the card pool without breaking anything has been a large part of my own growth in handling Ned’s concerns. The ability to shift perspective from one layer of Nedliness to another and make value judgments to determine which layer is most important is a vital skill that I’m still working to hone. “Shagga likes the new and shiny” is the boiled down version of Eric Lang’s presentation of the “Shagga" player archetype. This player is easily bored and consistently needs something new and exciting to capture his or her imagination and stay invested in the game. Sometimes this “new and shiny” takes the form of a new cardtype. Sometimes it takes the form of a new agenda that introduces a new decktype. Sometimes it looks like a new mechanic, or keyword, or a new subfaction that gets trait-based synergies for the first time. Sometimes, it’s as simple as a powerful new card that changes the perception of an entire class of existing cards. Whatever the case, the Shagga player needs to see that the game is changing and evolving, and wants to be an active participant in the novelty of the new thing. When it comes to card level evaluation, a Shagga player tends to judge cards based on the originality and novelty of the ability. These players like to see cards with interesting effects and interactions that they haven’t seen or considered before. Designing Shagga oriented cards is one of the most enjoyable aspects of working on this game, as it challenges me to push the envelope and challenge players’ notions of what a card can and cannot do. But players, even the shaggiest of Shagga type players, like to see new ideas grow up and mature into fully realized aspects of the game. Sometimes, when change is constant, a period of relative stability can be novel. All new all the time gets old. Introducing new concepts, and then giving players a stable period to explore those concepts before moving on to the next “new and shiny” is the best way to keep people invested and allow the game to evolve. At the vision level, I now track how much novelty is introduced with each new set, to ensure that there is enough time for the Shagga player to play with new toys. “Winning isn’t everything. 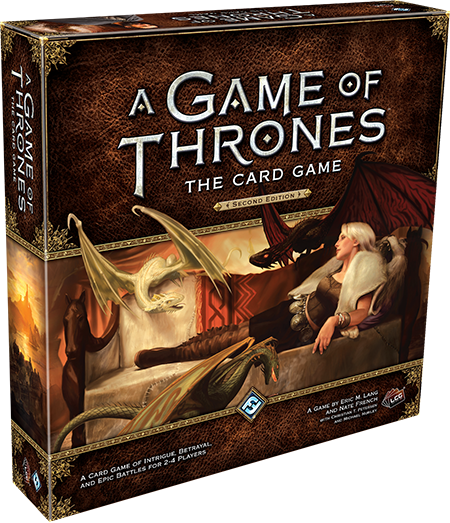 It’s the only thing.” That’s the motto of the “Jaime” player archetype, who plays to win at all costs. A pure Jaime player evaluates each card in terms of its sheer efficiency and power level—to what extent does this card help a player win games? This constant bottom line evaluation of the card pool may seem cold to Ned (who cares about theme) and Shagga (who cares about original mechanics), but to Jaime, none of that matters. This player wants an edge and will play whatever it takes to get that edge. On the surface, Jaime seems like a pretty cut and dry archetype, but I’ve learned some things about this player type as well over the years. One of these things was a fundamental shift in my understanding of what the archetype described. When I first digested Eric’s original article that introduced me to the archetype, I jumped to the erroneous conclusion that all Jaime players were “good” players. This was a mistake: the archetype describes a player’s motivation, what that player wants out of the game, and how that player approaches the card pool. It doesn’t describe or have any bearing on a player’s results. 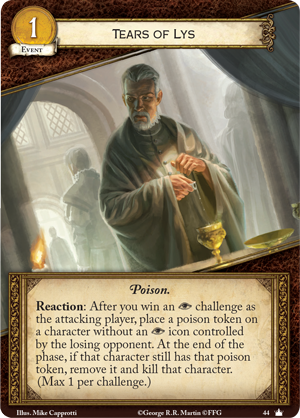 Over time, I learned that the “bad Jaime” does exists in card game circles: the player who only cares about winning, evaluates the card pool through this prism, but—in spite of this approach—still loses games with regularity. 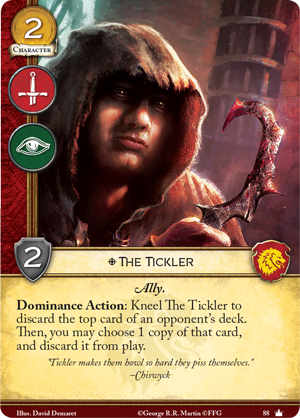 To deal with the reality that not all Jaime players are created equal, I like to challenge these players with both “hidden gems” (cards that are initially dismissed, but turn out to be extremely potent) and “trap” cards (cards initially lauded as “broken” that turn out to be mediocre or duds). It’s important to remember that the above concepts are player archetypes: imaginary extremes that are useful for creating perspective when discussing and evaluating new design. It’s rare to encounter a real player who purely relates to a single archetype: most players are a hybrid mix of multiple archetypes, and this mix gives each of us a unique relationship with the game. It’s also worth noting that we each have conscious control over this mix, and if a player pushes the boundaries of his or her motivational comfort zone, that player can add enjoyment and depth to the experience of the game. 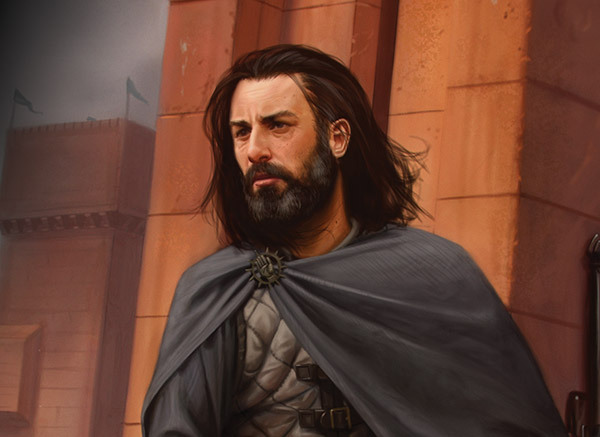 If I find myself predominantly identifying with the Jaime archetype and evaluating the card pool through a “winning is everything” perspective, I might challenge myself to find a means to win (invoking my natural Jaime) with a combination that no one has ever seen before (sprinkle in some more Shagga)—and by doing so, I enrich my experience. Or maybe I am a strong Shagga player who loves the game mechanics but has never read the books. In that case, I can increase my enjoyment and appreciation of the characters depicted on the cards by picking up Martin’s novels and immersing myself in his world. Whether you’re a new player encountering these archetypes for the first time or a long time veteran revisiting old friends, I hope you’ve enjoyed this discussion of Eric Lang’s three foundational player archetypes—they are a deeply ingrained part of the history of this game and its community. Thank you for reading, and I’ll see you on the other side of the launch!